The after effects of Lyle Lanley's monorail bears eerie similarities to the potential impact Line 9 could have in Canada. via the Simpsons Wiki. In a classic episode of the Simpsons, a travelling salesman named Lyle Lanley visits a town meeting and convinces the people of Springfield to invest in a monorail—a lavish train system that the town welcomes with a song. But Marge Simpson remains skeptical, so she visits North Haverbrook where a previous Lanley monorail was built: Houses and businesses are abandoned, people are traumatized, and the remains of a derailed train hang precariously off of broken tracks in the town’s centre. A scientist clarifies, “this is all that’s left of one of the crappiest trains ever built.” But Marge is too late to warn Springfield and on the new monorail’s maiden voyage its brakes fail, nearly killing everyone on board. Meanwhile, Lyle Lanley boards a flight out of town with two giant suitcases full of money. 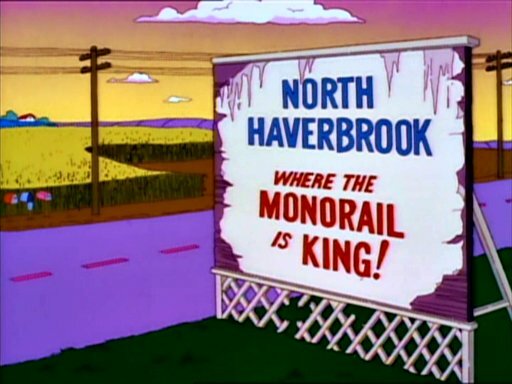 Enbridge’s new proposal for its 37-year-old Line 9 pipeline is a lot like the Springfield monorail. The people of Ontario and Quebec are being sold on a tar sands pipeline that has a “high risk” of rupture in its “early years” of operation. And a rupture of this pipeline, which cuts through the most densely populated part of Canada and crosses twelve major watersheds, could result in an unprecedented catastrophe. Never before has a pipeline carrying diluted tar sands bitumen (dilbit) passed through, or ruptured in, a major urban centre. Like the desolate town Marge visits, we should pay close attention to other communities with pipelines like Line 9. 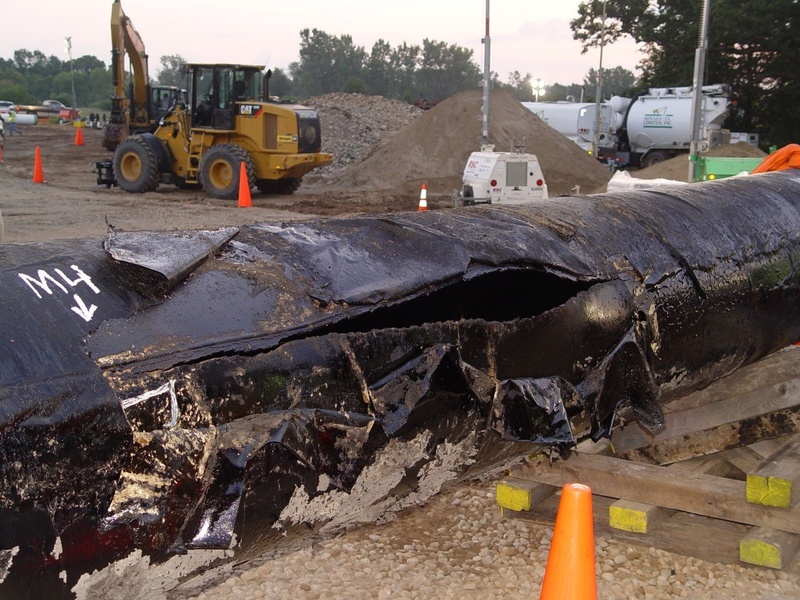 In Kalamazoo, Michigan an almost identical Enbridge pipeline (Line 6B) ruptured leaking 3.3 million litres of dilbit, poisoning that community and leading to the most expensive on-land oil clean up in US history. Like the Monorail itself, where Lanley cut corners on everything, Line 9 is already in crummy shape—a report submitted to the National Energy Board by pipeline safety expert Richard Kuprewicz found that “both Line 9A and 9B segments have extensive crack threat sites . . . similar to those observed in Line 6B [of Kalamazoo] across that system.” And just as Lyle Lanley is the only financial benefactor of the monorail, Line 9 benefits oil producers from Alberta, Enbridge, and, to some extent, refineries in Quebec—while the health and safety of millions of Canadians is put at risk. Yet unlike the residents of fictional Springfield, we, the people of Ontario and Quebec, have been shut out of our own town hall. For more than three decades, Line 9 has been used to ship North African liquid crude west from Montreal to refineries in Sarnia. During this time, according to Enbridge, the line has spilled thirteen times. Given the broader context of Enbridge’s operations, these spills are no surprise. Indicated in the company’s own files, between 1999 and 2010 it oversaw “804 spills that released 161,475 barrels [or 25.67 million litres] ... of hydrocarbons into the environment”—making for an average of 73 pipeline failures per year. Enbridge has applied to the National Energy Board of Canada (NEB) to repurpose this old pipeline—they hope to reverse its direction, increase its flow, and use it to ship unconventional fuels including diluted bitumen and highly explosive Bakken. The pipeline was not designed to transport these materials, and therein lies a world of risk. If the NEB allows Enbridge to pump dilbit through Line 9, its chance of rupture will increase dramatically. Here's what the ruptured pipeline in Kalamazoo looked like. via the NTSB. But what alarms me about Enbridge’s proposal to ship dilbit through Line 9 isn’t just that “there is a high risk the pipeline will rupture in the early years following the Project’s implementation,” but just how fucked we’ll all be when that rupture occurs. “Vapours or dust may be harmful or fatal . . .
High vapour concentrations are irritating to the eyes, nose, throat and lungs; may cause headaches and dizziness; may be anaesthetic and may cause other central nervous system effects, including death. Hydrogen sulphide gas may be released. Hydrogen sulphide may cause irritation, breathing failure, coma and death, without necessarily any warning odour being sensed. When a dilbit spill occurs, the mixture of light diluent and heavy bitumen separates. The diluent evaporates into the air, putting those nearby at risk of toxic exposure when they breathe. This type of exposure affected residents near the Kalamazoo oil spill—the US National Transportation Safety Board noted a high rate of benzene exposure among those living near the spill while a Michigan Department of Community Health study, cited in an op-ed by Mike Schreiner, found that “of 550 people . . . 58% of those contacted suffered from adverse health effects, most commonly headaches, respiratory problems, and nausea.” Other than cancer, we can only speculate about what kind of long term health problems dilbit exposure can lead to – its exact chemical make-up is a guarded secret. But long after the airborne toxins released by a pipeline rupture have dispersed, bitumen remains on the ground. And if a dilbit spill happens in water, the bitumen sinks, making it almost impossible to recover. The Kalamazoo river clean-up, which is ongoing after 3 years, included efforts to dredge and re-dredge the river which have not yet been totally successful. Cleaning up dilbit spills is something oil companies haven’t had much experience with—a fact that was made embarrassingly apparent when Exxon Mobil was caught trying to clean up its dilbit spill in Arkansas with pieces of paper towel. The Goodman’s Group’s cost-benefit analysis “concludes that the potential economic costs could exceed . . . the potential economic benefits” of the pipeline reversal, with benefits “in the order of less than $1 billion per year and 200 jobs per year over the period of 2013-2043.” The report also voices concern over Enbridge’s financial ability to fully clean up and remediate a spill from Line 9. While their dilbit spill in the 7,000 person community of Marshall has exceeded $1 billion in clean-up costs, the report estimates that the potential costs of a Line 9 rupture could range from $5 to $10 billion in damages, and notes that Enbridge is currently only insured $685 million in case of an oil spill. As we have already witnessed, following the tragedy of Lac-Mégantic, companies can find ways to avoid paying clean-up costs following a catastrophe of their making. Following the Kalamazoo rupture, the NTSB offered one of the most damning indictments of a pipeline operator in history. Comparing Enbridge’s employees to an utterly inept slapstick comedy police force from the 1920s, the NTSB’s chairman Deborah A.P. Hersman said that her “investigation identified a complete breakdown of safety at Enbridge. Their employees performed like Keystone Kops and failed to recognize their pipeline had ruptured and continued to pump crude into the environment… despite multiple alarms and a loss of pressure in the pipeline, for more than 17 hours and through three shifts they failed to follow their own shutdown procedures." 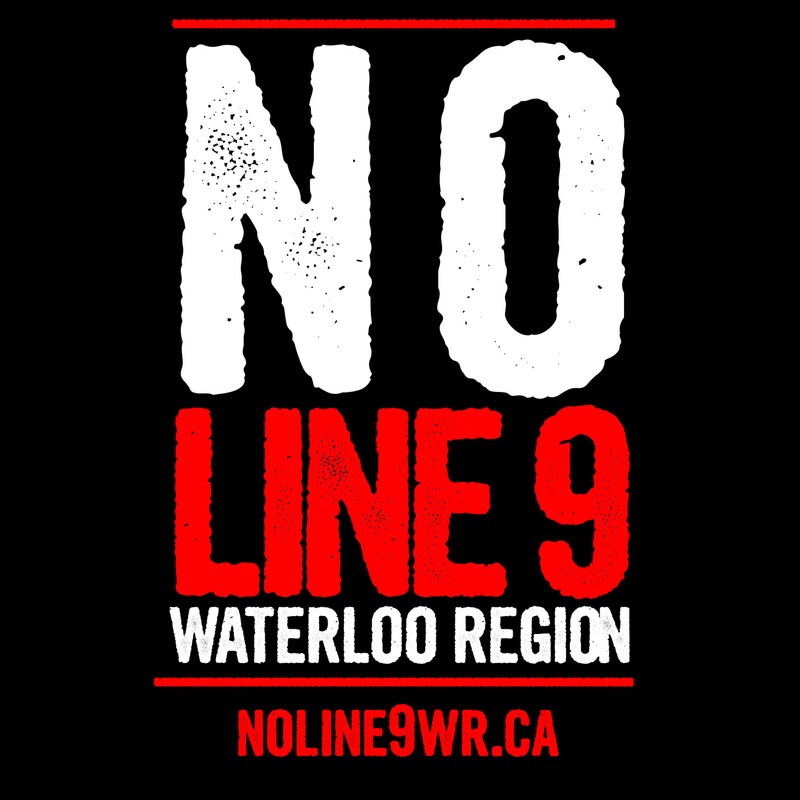 At the whims of the NEB, Line 9 could be carrying diluted bitumen by early 2014, following hearings in October that will be met with protest. Phase one of the project, a reversal from Sarnia to Westover (Hamilton), has already been approved—prompting an activist occupation of the Westover pump station. We can only hope that the few members of the NEB who hold unequivocal power over future of Ontario and Quebec are paying some attention to the protesters chanting outside of their hearing—and haven’t been seduced by the Monorail-esque sales pitch that Enbridge is pushing.